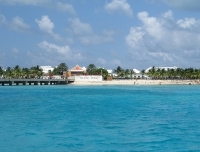 Charming Cockburn Town, capital of the Turks and Caicos Islands, is the centrepiece of the little bean-shaped island of Grand Turk. The laid-back capital, with donkeys and horses casually wandering the streets, sports a collection of quaint inns, boutiques and colourful colonial houses. This 400-year-old town boasts an interesting cultural history museum recording the discovery and development of the islands. Also in the museum are mementoes associated with astronaut John Glenn, first American to orbit the earth, who spent time on Grand Turk after his space capsule splashed down offshore. Cockburn is also a busy financial centre, acting as a tax haven for offshore investors. Whether visiting for business or pleasure few of those who stay on Grand Turk can resist the call of the crystal clear surrounding sea. The island's quiet beaches give on to magnificent coral reefs offering some of the world's best wall diving opportunities, particularly on the western shore. Other activities that can be enjoyed on Grand Turk include bird watching, beachcombing, horseback riding, whale watching, hiking or taking excursions to surrounding islands or cays. We are looking for contributors for our Grand Turk travel guide. If you are a local, a regular traveller to Grand Turk or a travel professional with time to contribute and answer occasional forum questions, please contact us.